Discussion in 'Classic Menswear' started by SpooPoker, Mar 5, 2012. I chatted with Carmina's representatives on their website today, and was informed that "Inca 9 would be just a little smaller than Rain 9.5, 1mm shorter and 1mm narrower". So, to answer my own question, I think Inca 9 should be OK with me. I hope it works! I do think the “where” of the toebox difference is important - Inca has more room for the small toes but less for the big toe, Rain is the opposite. Thanks! From the shape of the last, it appears so. Luckily, for me, my longest toe is the 2nd one, and my small toe is always problematic (especially with the Simpson 9.5, and even with *some* of Rain 9.5). I guess I would have less of a problem with Inca 9 than I thought, then. Trigger pulled (but won't be home to see it until 20th, sadly). I'm wondering which full strap loafer to get Uetam vs Uetam EE. L foot is a 10.5C R is a 10D on a on a Brannock device but Meermin's Lasts Hiro and Elton both fit well in size 10 UK I assume I should go with size 10 for Carmina as well. If anyone can give some insight that would be helpful. How much bigger (in all dimensions: length, width, instep) for “Simpson 10.5 Oxford” feels comparing to “Rain 9.5 Derby” and “Inca 9.5 Double Monk”? Question for those who've purchased any of their Cordovan Shell Wholecuts in the Rain Last: The representative on the site's chat (super helpful by the way) stated that even though I'm a 10.5E Brannock (9.5UK), it might be worth going down to a 9UK due to how roomy the Cordovan Wholecut is. The theory of it makes sense, but I wanted to know if anyone has had experience or noticed a difference on a standard Rain captoe/longwing/etc vs a Rain wholecut. I'm 10.5D US Brannock, and I found Rain 9.5 to be pretty good fit, but not "snug". I have yet to try Rain 9, but I think it would fit very snuggly. I actually have a used pair of Rain 9 (which I found on eBay) coming. So, in a week I should be able to tell you the differences between Rain 9.5 (Wholecut, Derby, Wingtip oxford) and Rain 9 (Wingtip oxford). For your question: I don't notice any big difference, if at all, for the fitting of Rain 9.5 in all aforementioned designs. Perhaps because it's a slightly loose fit for me to begin with. But, as I mentioned, I personally found it to be pretty good fit (at least for how I like it). Unless their wholecut is vastly different than their oxford wingtip I think going down 1.5 would be too small. I'm a 10.5 and wear 9.5UK in cordovan Rain. The heel is bigger than I'd like in general, I had heel slip as the shoes broke in. But now they're very comfortable. Thanks for the advice! So the 9UK would most likely be way too small, right? More than likely. My feet is narrower than yours (10.5D, yours are E) and I don't think 9.5 Rain is too roomy. It is roomy, though. This is how they fit me. Noticing the almost completely closed V-gap. I could completely close it if I pull them tighter. But it would be less comfortable for me (and my preference of how I like them to fit). I tried a standard captoe oxford in size 9UK rain last, and it fit perfectly. 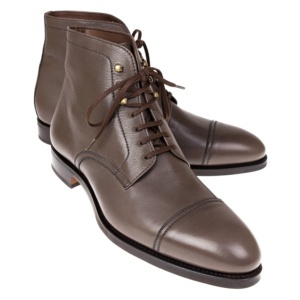 I then tried a lace up derby boot from the rain last again in size 9 but it was too tight and had to size up to 9.5UK. What would you reccomend for an TMO like the swan neck? Do you think 9UK would be safe since it's an oxford? Looking to pick up my second pair of Carminas. I currently have a pair of wholecuts on rain last in 6.5 UK. They are wearable but really tight all over, especially over the instep. Wondering if I should size up .5 and/or try a different last. Trying on is not possible where I am. Any suggestions appreciated. Considering that Rain has considerably high instep and quite generous fitting already, compared to many other lasts (at least in my experience), I would suggest sizing up by 0.5 from what you have “for most Carmina lasts” (and 1 if you go Simpson). That means I would suggsst 7UK Rain, Inca, Forest, Buger, 7.5 Simpson. Maybe you can go 6.5 Soller and Detroit, but I’m not sure about the instep of these two for this case). Hey thanks for the advice. Very helpful! I'm a 7 in Inca and Rain. Inca fits well. I have 3 pairs of rain and they all fit different. 1 is tight and the other 2 are looser. I also have several pairs of Carmina Rain lasted shoes. They fit diferently as well. I believe it's a quality control issue. I have the EXACT same pairs of shoes in different color but some fit loosely, some are little tight.